It is not easy to get rid of Norway and roof rats if they have already settled down in your home. Highly prolific rats thrive fast and cause a great damage to buildings and crop fields. They bring hazardous diseases into urban settings and cast a blight on the human life. Rat removal is connected with poisoning, trapping and repelling methods. If you find such signs as fresh rat droppings in your dwelling, hear gnawing and scratching noises in the kitchen and inside the walls, or see a big “mouse” running across, take actions for pest eradication. Start your rat removal plan from cleanliness, repair and sanitation. Always keep your house, basement and attic, garage, and barns clean. Plug all the holes and cracks in the foundation, roof, walls, crawling spaces. Rodents can squeeze through any tiny cracks and holes. For proper and thorough rat removal, call a professional to repair water and drainage pipes, septic tanks, roofs, doors and windows. In fact, natural ways of getting rid of rats include sound and smell repelling methods, rat-hunting pets, natural gluten products, and baits with cork, glass, steel wool and cement. To some extent, these preventive measures are effective. However, when hungry, rats do not pay attention to the frightening odor, cats and dogs nearby, unpleasant sound, and they gnaw through to get the meal. Moreover, the black and brown rats tend to get accustomed to any dangerous smells, sounds, emissions and strobing lights and tend not to care anymore. In practice, rats are so clever and crafty, that they are able to dodge and avoid traps that humans leave. 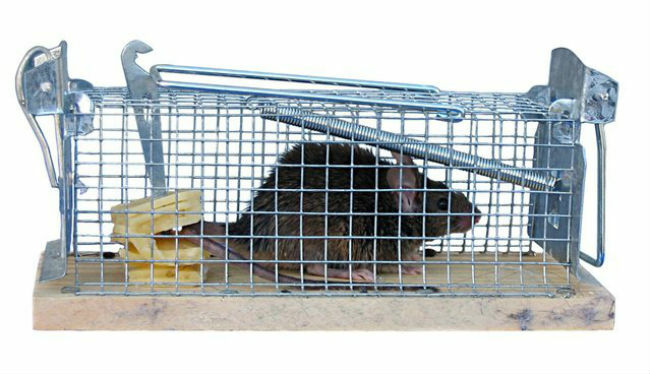 Homeowners use different types of ratters: conventional metal rat traps, cage traps, wooden rattraps, glue traps, electronic rat traps and toxic bait traps. The two latter are the most effective. In order to attract rats, use sunflower seeds, bread, nut meat, peanut butter, bacon, or wheat as a bait. Place the meal for luring rats in the center or on the special bait area. Take measures to prevent domestic pets and kids from having access to the baits and traps. Use rattraps around the potential rat habitats and throughout the infested area. Place them in front of holes and cracks, along the baseboards and inside crawlspaces where rodents prowl about and enter the building. Roof and Norway rats are large rodents. Hence, conventional glue boards are light and not effective against them. Simply purchase the rodent glue and spread a thick layer onto heavy clay tiles for flooring. Place some bait in the center of the sticky trap. This method of rat removal is a safe, clean, non-toxic and reliable alternative to dangerous traps and chemical baits. High voltage electronic shock can kill a rat at once, while conventional traps and poisonous meal baits make rodents suffer from starvation and die on the gridiron. Moreover, rat killers are designed safe to children and pets. Protection switch prevents mistake electric shock to human. Thus, electronic rat zappers can be widely applied in kitchens, dining-rooms, bedrooms, hotels, offices and any places where rats regularly enter or appear. Toxic bait traps are commercially available nowadays. They do not catch rats as other traps do. They contain a source of food contaminated with chemicals. In addition, rodenticides should kill rats in some time after bait ingestion. The sly rats do not associate the damage and death with their feeding habits in this case. Warfarin, coumatetralyl, difenacoum, brodifacoum and bromadiolone are the common active ingredients of common, consumer-use baits. In fact, these toxins damage blood vessels and affect respiratory systems of rodents. Thus, the rats may die in a week or two after oral ingestion. In practice, rats may consume the lethal dose in one or two feedings. The first dead rodents will appear in 4-5 days after feeding begins. Beware! Always keep or lay poison or toxic bait stations out of the reach of children and domestic animals. 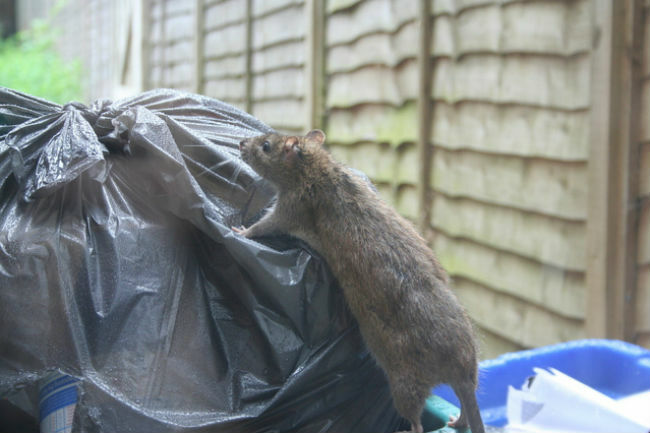 Seek a professional rat control help if you are not able to get rid of rats on your own. In fact, pest control services apply professional, highly effective rodenticides, such as Sodium Fluoroacetate 1080 and Pindone. Besides, they can provide the whole-house fumigation with Phosphides to exterminate rats inside the walls, crawlspaces and other less accessible areas.